The Nikon Coolpix S6500 is a wi-fi enabled digital compact camera that has a 16 megapixel back-illuminated CMOS sensor and EXPEED C2 processor inside its square frame. It also benefits from a 12x optical zoom, Full HD video, built-in wi-fi, Auto HDR mode, 10 frames per second burst shooting and a smart portrait system. 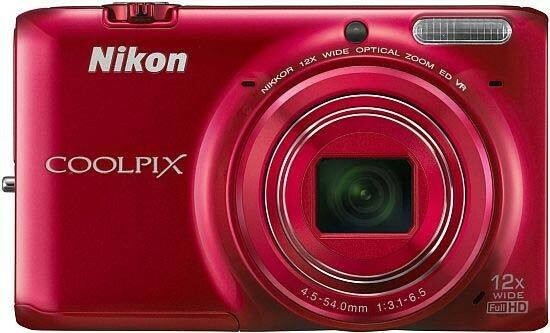 Available in black, silver, orange, white, blue and red, the Nikon Coolpix S6500 costs around £199 / $220. Let's start this off by saying that the Nikon Coolpix S6500 is a good looking camera. So it's no surprise that it fits in to the Style range of their models. It's a flat edged rectangle of a camera with slightly curved edges to soften it up a bit. All sides apart from the back are covered in a gloss plastic finish that's aesthetically pleasing. There's nothing about the layout that sets the camera apart, though. Everything is where it is (and some would say where it should be). The 12x optical zoom bulges out slightly from the body, but that's to be expected unless they use a physically smaller lens element to allow for more telescopic barrels. The lens starts at 25mm at the widest setting. This means it can then zoom out to a belly busting 300mm. Of course if it can zoom out that far, then that could cause complications with the amount of light able to fall on the sensor, due to the restricted field of view. One attempt that Nikon have made to combat this issue is to fit the S6500 with a back-illuminated sensor. If you're unfamiliar with what these are, they're not actually what the name suggests. If anything the term “back-illuminated” is a nick-name because the back of them isn't actually illuminated. A traditional sensor is designed with all the pixels on the front of the sensor. Each pixel is surrounded by the circuitry needed to send the information from the sensor to the processor which converts the information into a photograph. The downside is that the micro-circuitry blocks some of the light that could pass onto the pixel. A back-illuminated sensor has the circuitry placed on the back of the sensor which then allows more light to fall on each pixel and make it more responsive to light. If you were to compare a traditional sensor next to a back-illuminated sensor, it would look like it was mounted back to front, so all the light would be illuminating the back; hence the name. If anything it should be called a “Rear Mounted Circuit” sensor, or something else equally as boring. The fact is that this way, it sounds funnier and we get to use terms such as “it's lit up from the back-side”. It also means you get a camera that can cope better when it gets dark and retain lower ISO settings to get cleaner images than comparable traditional sensors. The full ISO test will confirm whether it's the case or not. There's references all over the S6500 page on the Nikon website as well as the manuals about an AutoHDR mode. HDR stands for High Dynamic Range. It expands what the camera can “see” by taking multiple exposures and combining them together to create one shot. The result is a shot that uses an over exposed image to bring out detail in dark areas, a perfectly exposed image for the mid-tones and an underexposed image to prevent bleaching on light areas, such as the sky. The S6500 only does this on the Backlighting scene mode and it also only uses two pictures. It takes one picture to compensate for the bright background (the subject would normally be silhouetted) and one to illuminate the subject (which would burn out the background). It then combines the best bits of both to get the best results. One of the little used features on a digital compact camera is the subject tracking AF. To start it up, you have to select it in the Main menu under AF area mode. You then find the subject and place them in the AF square. Press ok on the back of the camera and the focus system will lock on the subject regardless of whether you move the camera or whether it moves. Press ok again and it releases the lock. This is great for moving subjects such as wildlife, kids or transport photography. However, we're unsure on using the ok button to lock it. A simpler system for the end user would be to use the focus lock on the shutter release as the subject lock. The camera then tracks as long as the subject is in the frame. You take a picture as normal and if you give up, just point the camera away from the subject to release the lock. Still, it works well enough and seems to keep up with all but the fastest movement. Speaking of speed, the Nikon Coolpix S6500 starts up and takes a picture in around 2.5sec which is about standard for a digital compact camera. There are two continuous burst modes (High and Low) as well as a few alternatives such as pre-shoot cache, Best Shot Selector, Multi-shot 16 and two ultra high speed continuous modes which record at 120fps or 60fps (frames per second). These latter two options will drop the resolution severely, so keep an eye on that. Now Nikon say that the camera records at a rate of 10fps. This is where it gets a little confusing. You see only seven images will be recorded. But they're recorded at a speed of 10fps. Only getting seven pictures can make you think it's working slower, but it records them in 0.7sec. If it continued to the tenth frame, it would do it in one second and that's the important part to keep in mind. Playing back the pictures can be done regardless of whether the Nikon Coolpix S6500 is on or not. Press the blue arrow and the pictures you've taken will come up on the screen. You can zoom into them using the zoom switch or zoom out and view them as thumbnails. Press the menu button and the Playback menu pops up on screen. You can perform some simple editing such as adding D-Lighting, perform and Quick retouch, start a slide-show or Glamour retouch if it's a portrait. If you've set up the Quick effects in the Main menu, pressing ok will take you into the editing screen. The picture will be displayed multiple times with various effects and all you have to do is select your favourite. The system is non-destructive, so will save an extra copy as well as the original. In the box, you get a Basic start guide, software CD with View NX2 and the full manual on it. IN the main compartment with the camera is a lithium ion battery, USB cable and charging unit for the camera. You also get a small wrist strap to keep it safe while not in use or if the kids are using it.